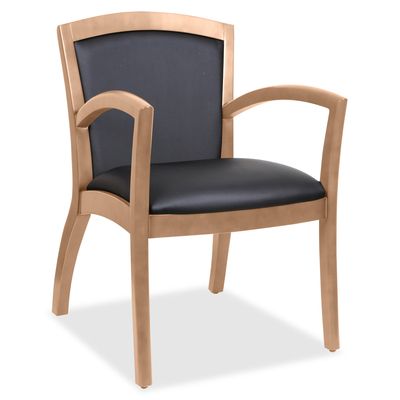 Guest Chair Offers An Elegant Solution For Guest Seating With A Wood Frame And Black Bonded Leather Upholstery On The 3-6/11" Thick Seat Cushion And 1-3/8" Thick Back Cushion. Solid Wood Frame With Heavy-Duty Stain Finish Provides Durability And Strength. Frame Is Made Of Rubber Wood For A Uniform Texture And Light Luster. This Kind Of Wood Is Not Easy To Crack In Dry Areas. Fully Assembled Chair Also Features Fixed, Arched Arms And A Four-Leg Base With The Back Legs Arched For Better Stability. Nonskid Base Includes Levelers For Uneven Floors. Weight Capacity Is 250 Lb. Seat Measures 20-1/8" Wide X 19-1/8" Deep. Back Size Is 21-5/8" Wide X 15-1/3" High.. Guest Chair Offers An Elegant Solution For Guest Seating With A Wood Frame And Black Bonded Leather Upholstery On The 3-6/11" Thick Seat Cushion And 1-3/8" Thick Back Cushion. Solid Wood Frame With Heavy-Duty Stain Finish Provides Durability And Strength. Frame Is Made Of Rubber Wood For A Uniform Texture And Light Luster. This Kind Of Wood Is Not Easy To Crack In Dry Areas. Fully Assembled Chair Also Features Fixed, Arched Arms And A Four-Leg Base With The Back Legs Arched For Better Stability. Nonskid Base Includes Levelers For Uneven Floors. Weight Capacity Is 250 Lb. Seat Measures 20-1/8" Wide X 19-1/8" Deep. Back Size Is 21-5/8" Wide X 15-1/3" High.